If you have a room arranged in a such a way that the furnace vents are underneath your furniture, you might benefit from an Extend A Vent. But don’t buy one from Amazon, or anywhere else for that matter. It is hardly worth the $15, or $17, or $18 that most places online are charging for these two flimsy pieces of plastic that barely fit together. I bought one, and like many others who commented on Amazon’s page, I felt like I had been taken. 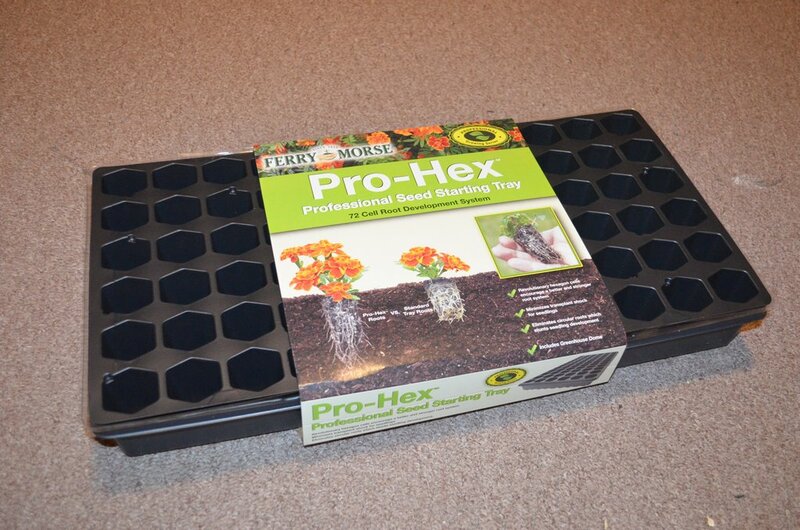 When my wife saw the product, she said, “hey, that looks just like my seed trays!” She was right. 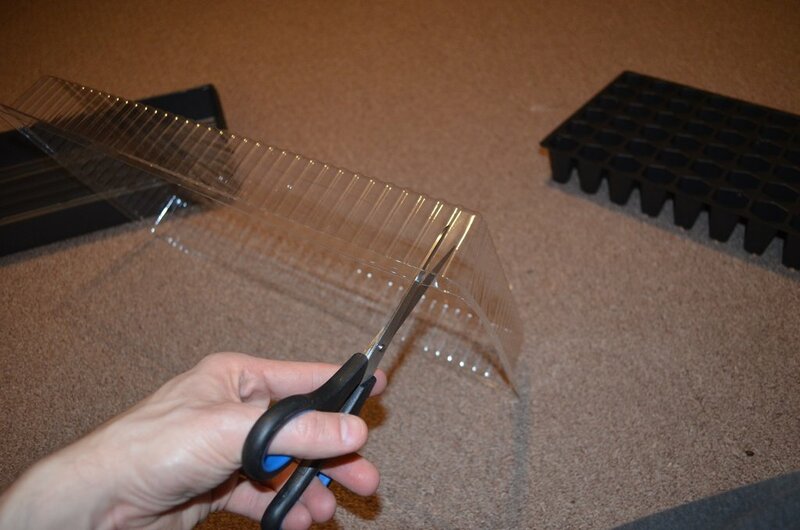 The plastic is the same thickness, and same general length and shape as the Jiffy Seed Starter trays you can buy at Lowes, and Home Depot for five dollars. The trays are 21 inches long and 10.5 inches wide, which means they won’t quite fit the entire width of a standard 12″ vent. However, one of the most common complaints in the Amazon comments is the same thing about the Extend A Vent because it’s only 11 inches wide, so it doesn’t fit either. My experience was that both products are wide enough to cover the actual slots in the vent, but I agree that it is ridiculous that the Extend A Vent, a product that was presumably designed specifically to fit a furnace vent, doesn’t actually fit all that well. By the way, the Jiffy tray lid is 2.5 inches tall (about an inch taller than the Extend A Vent), so it actually allows more airflow, but that may mean it won’t fit under certain furniture. I have two couches in my family room that cover up both vents in the room, so I needed two of these. 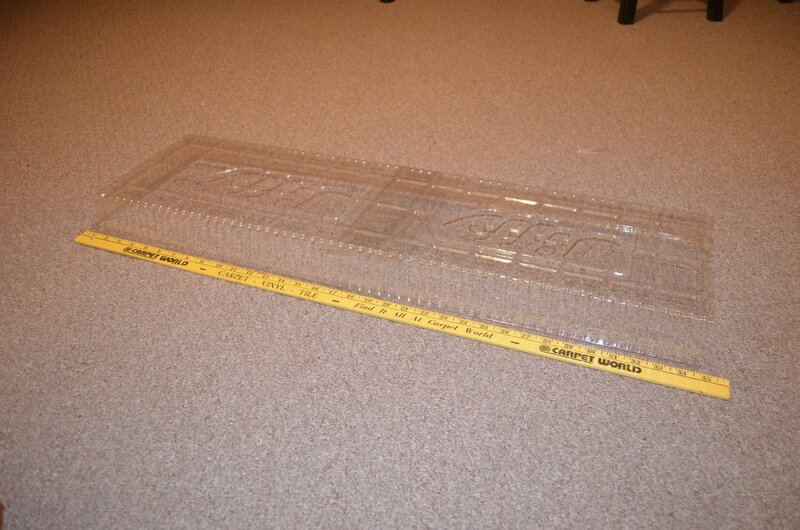 But even buying two Jiffy trays was only $10, still about half what I paid for one Extend A Vent. 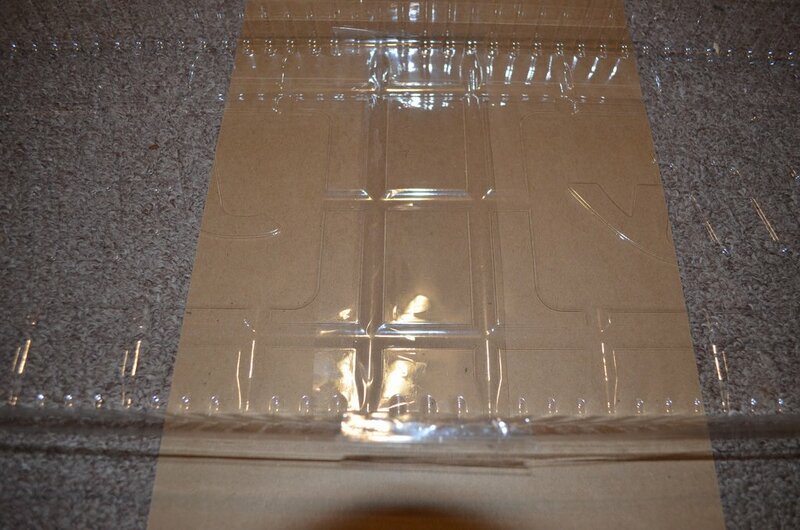 The lids are clear plastic, the trays themselves are black, but if you’re putting them under furniture where they won’t show, the trays will work just as well as the lids, so for $10, you’re actually getting enough material to make two Extend A Vents! So I simply cut the end off of one lid, and cut both ends off of the other lid. Then I overlapped the two lids a couple of inches until the grooves lined up, and then I taped them together with clear packing tape. 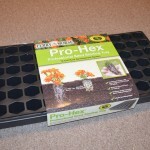 You can do the same thing with the trays (and the trays are slightly more rigid because they’re designed to hold soil). 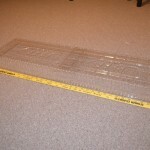 The finished product is about 34 inches long which should work for just about any couch or large chair. 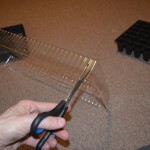 If you have smaller furniture, a single Jiffy tray lid will probably work for you. I slid mine under the couches and lined them up over the vents, and they work just as well as the Extend A Vent. Depending on the pressure coming out of your vents, you might find that you need a couple of small magnets to keep them aligned to the slots in the vent. So don’t buy an Extend A Vent! Make your own for cheap! Thanks for the tip. I have a vent under my bed, and have never thought of doing anything about it. I Knew that had to be a cheaper way…thank you. Would you be able to make a 90 degree turn? The vent is at the head of my bed – much longer than 36 inches. Plus, I want to direct the air into the middle of the room instead of out the door where the foot of my bed is- small room. Thanks. I suppose if you got creative with how you cut them and taped them together, you could probably turn a corner. But I haven’t tried that myself. 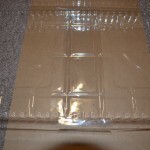 You might try using plastic paint tray liners as well. The shallow end over the vent. Cut out the end of the deeper end. For a short run, that’s a good idea too. That is a great idea! I have a baker’s rack in my kitchen that I can’t get a lot of use from because of that reason. It’s not that deep so this may be my solution. Thanks! Thank you so much! I was just about to purchase 4!! of these on Amazon but decided to read the reviews first. Because of your review (and instructions) I saved a lot of money and actually found the trays on sale at my local hardware store! I did 4 vents for about $6!! Thank you!!!! Plastic vent chutes that go in attics to allow venting past the insulation will work too. @~$2 each. Just seal one end by cutting along the edges, folding the flaps in, and taping. I love the idea – especially the saving money part, but that plastic seems VERY thin. Are you sure it doesn’t melt/warp? Maybe your furnace is a lot hotter than mine, but that has not been a problem at all. My 13 x 7 centrally located wall vent directs hot air onto the back of an antique buffet and upwards onto a large wooden hanging mirror. Damage to wood joints is happening, even with humidity control. Thanks for vent the tips. It’ll take some tricky routing (sideways)to protect my furniture, but now I think it’s possible! Does anyone know whether it would be okay to use a setup like this over a cold-air return? We have a very large (I think it’s something like 13×13) cold-air return vent in the living room, that cuts off a few feet of our wall/floor space. I always wished there was a way to get that floor space back, but I don’t know what kind of airflow needs to go to that register to maintain the heater properly. When I saw these extenders on Amazon I wondered if it would be a viable option. The only potential issue I see is that the plastic is pretty flimsy and if the volume of air moving into the return vent is sufficiently high it might cause the plastic to collapse and restrict the flow of air. For something like that, you might need a sturdier material like wood or metal. Found this on the web. Works a treat! We have a wall mounted vent behind a brand new leather sofa and this protects it from direct heat. Thanks! The ones they sell on Amazon and Walter drake are 10.5 x 20″ but my couch is 33″ deep so it was still just heating the bottom of the couch. This way i made it just the right length. I bought the Amazon one for $14. I didn’t realize my vent is 16” wide. So there’s 4” still blowing under my couch. I was also shocked at how thin and cheap the plastic is. They spent more on the cardboard packaging then the product itself. I’m returning it to Amazon and making my own. Thanks for the post on Amazon review and these instructions. I am so excited to try this! I thought the extender should be taller, as it is going under a bed, and longer too. This way I can make it as long as I need for much much cheaper! Thank you! I already have over 50 lbs of cardboard (mostly from Amazon) waiting to be recycled. Could I just use this cardboard to make diverters for my heat vents? Has anyone done this? I would appreciate any tips you can give me. Tom, I haven’t made these out of cardboard, but I don’t see any reason why you couldn’t do that.